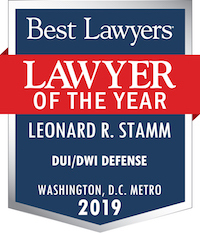 Constitutional rights Category Archives — Maryland DUI Lawyer Blog Published by Maryland DUI Attorneys — Goldstein & Stamm, P.A. The State’s Attorney for Baltimore City, has announced on January 29, 2019, that marijuana possession cases will no longer be prosecuted in Baltimore. In an article in the New York Times, Marilyn Mosby stated that it makes no sense to prosecute marijuana cases because it diverts resources from investigating more serious crimes and it alienates members of the community whose support police need to investigate these crimes. Additionally, the State’s Attorneys’ office will be reviewing 5,000 marijuana possession convictions and proposing legislation to make it easier to vacate convictions for marijuana possession. As the Daily Record reported yesterday (Jan. 23, 2019), a bill will be introduced in the Maryland legislature to expand Noah’s Law (named after Noah Leotta – a police officer killed by a drunk driver) to require an ignition interlock be installed as a condition of a probation before judgment. Currently, first offenders who blow a .15 or higher, or refuse to submit to a breath or blood test are required to obtain an ignition interlock for one year or have their licenses suspended for 180 or 270 days respectively (for a first test failure or refusal). If the driver submits to a test with a result of .08 or more but less than .15, the 180 day interlock is optional. That person may elect instead to drive with a permit that allows driving for work, school, medical, or alcohol education restricted driving privileges. Currently, some first offenders escape the interlock where they win the MVA hearing for a test failure or refusal, or if they have an out of state driver’s license. There are some significant problems with the proposal, such as dealing with individuals who share cars with family members, who don’t own a car, who have to drive clients to earn a living or who live out of state. Currently, out of state drivers are not allowed to participate in Maryland’s ignition interlock program. This can be a devastating problem for drivers who live out of state and work in Maryland. Additionally, the law would deprive judges of the discretion to deny interlock in an appropriate case. This was the decision the legislature made a few years ago when Noah’s Law was enacted. Also commercial drivers are not allowed to drive commercial vehicles while their licenses are restricted in this way. 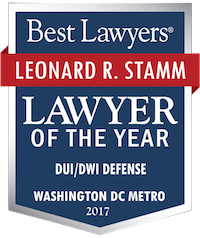 On Wednesday, September 12, 2018, Leonard Stamm appeared in the Court of Appeals to argue the case of Owusu v. MVA. Owusu was arrested for drunk driving and taken to the police station. At the police station he was read the DR-15 Advice of Rights Form. This is a form police officers are required to read to DUI suspects advising them of the penalties for refusing or failing a breath test for alcohol. In Owusu’s case he was read the form and told that if he failed the test he would lose his driver’s license for 180 days, but that if he refused he would lose his license for 270 days. Additionally he was told that since he had a commercial driver’s license or CDL, that if he refused the test his CDL would be disqualified for one year. The one year disqualification meant that he not be able to perform his job as a bus driver for one year. Immediately after reading the form, that contained a lot of other information as well, to Owusu, the officer tried to be helpful. He told Owusu that since he was a bus driver he would be out of work for 180 days if he failed the test and 270 days if he refused. Although probably well meaning, the officer’s statement was false. Critically, the officer did not tell Owusu he would be out of work for one year if he refused as a result of the one year disqualification of his CDL. The one year disqualification was huge because it means Owusu will have to retake the CDL knowledge and skill tests with it, but not with a 270 day suspension. Owusu testified at the hearing that after the officer advised him, he was not aware he would lose his CDL, and that, if he had he would have submitted to the test. As Stamm had argued in the MVA hearing and again in the Montgomery County Circuit Court without success that the giving of the false advice failed to comply with the relevant law requiring the arresting officer to “fully advise” the driver of the administrative penalties and also violated Owusu’s due process rights. Stamm also unsuccessfully argued in the hearing and appellate court that the DR-15’s form’s advice of a 270 day suspension on a refusal, and eligibility for a restricted license, without telling drivers that the required period of interlock restriction is longer, one year, violated his statutory and due process rights. Happy July 4th! – Can We Make the Nazi Comparison Yet? I was born in 1955, ten years after the end of the Holocaust. Growing up, I was fascinated and terrified by thoughts of it. What would it have been like to have lived through that period? What would it have felt like? I am Jewish. Would I have survived? Would I have ended in a death camp, as a slave laborer, hiding in a cellar, or fought in the Resistance? How would other people who were not Jewish have treated me or my family? How could normal people let such a thing happen? Could it happen anywhere else? Were Germans different than other people or is any group of people capable of perpetrating such horrors? “Never again!” proclaimed the survivors. In recent posts on Facebook, I have coined the term my “Never again radar.” It is going off now. The usual response to comparisons with Nazism and Hitler is that such comparisons are basically an admission of the weakness of the argument. The misuse of such comparisons runs the risk of trivializing the comparisons, and of not being taken seriously when the comparison is justified. With Trump however, I believe the comparison is justified for the reasons I argue below. As I have thought about this blog for a while, I visualized about five similarities. But then when I started to list them, it became apparent that five was too limited. My first written list of ten grew quickly to eighteen. Here is the list, I offer brief descriptions of each below: persistent lying; alternative facts; attacks on the press; promotion of bigotry and racism; loss of civility and respect for government officials; gaslighting opponents; hypocrisy; attacks on judges; nationalism and demanding obedience to the flag; demanding loyalty; mass rallies with exhortations to radicalism; encouragement of violence against opponents; advocating jail for political opponents; support for autocrats and attacks on democratic leaders; Nazi dog whistles; Nazi support; studying Hitler’s speeches, and attacks on the rule of law. There is some overlap here. I don’t claim this is an exclusive list, and I have deliberately left out some other equally odious character traits of Trump’s that do not necessarily justify invoking the Nazi comparison, such as his misogynistic treatment of women, nepotism, narcissism, corruption, theft, or the Russia investigation. And my brief overview can’t possibly do justice to the myriad of ways Trump has attacked our country. SB722 and HB1205 withdrawn after testimony from Stamm and others! Many people will remember the nurse in Utah who refused to draw blood in a DUI case under directions from a police officer and was arrested. She subsequently settled a lawsuit for $500,000 and the officer was fired. As a result the Utah legislature tried to fix the problem. In Anne Arundel County doctors and nurses have also refused to follow illegal directions from police officers. In response, bills were introduced in the Maryland Senate and Maryland House of Delegates to try to fix the problem. The bill would require qualified medical persons to withdraw blood where the driver did not consent to a test after an officer developed reasonable grounds (defined as reasonable articulable suspicion) to believe a person was driving while impaired by alcohol or drugs and there was an accident resulting in a fatality or life threatening injury. The problem is that the Supreme Court has held in two cases, Missouri v. McNeely, 133 S. Ct. 1552, 185 L. Ed. 2d 696 (2013) and Birchfield v. North Dakota, 136 S. Ct. 2160 (2016), that before police may direct a qualified medical person to withdraw blood the officer must have probable cause and a warrant, unless an exception to the warrant requirement such as exigent circumstances or consent exists. However, not every case involving a fatal or life threatening injury will involve exigent circumstances. President Trump, by calling the news media “the enemy of the people” and calling facts “fake news” is attacking all of us. Thursday and Friday he attacked Joe Scarborough and Mika Brzezinski. Today he released a wrestling video, showing him punching and wrestling a person with a CNN logo on his head. He calls CNN FNN – fake national news. There is a reason that freedom of the press is enshrined in the First Amendment. The Founders set up an elaborate system of checks and balances that is being tested as never before, at least during our lifetimes. With a Congress unwilling to restrain the executive, willing to steal Supreme Court seats, an executive that repeatedly lies, insults, and bullies his opponents, an independent counsel that could be fired as soon as Trump thinks he can get a way with it, and a president that is unwilling or unable to defend the country against a Russian cyber attack, the media is our last line of defense. Yesterday, the Supreme Court ruled that the injunctions against enforcement of Trump’s travel ban, that had been upheld by the Fourth and Ninth Circuits would be upheld in part and reversed in part. Trump claimed this was a victory, but a careful reading of the majority opinion reveals otherwise. The plaintiffs in the cases argued for a stay because the travel ban would cause irreparable injury to them and by implication, persons who were similarly situated. The parties who claimed irreparable injury were parties who had family members, friends, and students coming to the US. Foreign nationals who had no connection with anyone in this country did not bring the lawsuit, and have no constitutional right to come to this country. In a sense the Supreme Court basically said that anyone that claimed irreparable injury and those similarly situated (“who have a credible claim of a bona fide relationship with a person or entity in the United States”) could not be barred from entering the country. To the extent that the lower court’s injunctions covered parties not involved in the lawsuit, in essence, they were overbroad. Essentially all of the plaintiffs prevailed in the Supreme Court as to their interests. Trump prevailed against foreign nationals who were not active in the litigation. In other words, Trump lost to no one initially, and then prevailed over them. Everyone who sued Trump won at the injunction stage. There can be no doubt after Trump’s bizarre press conference with the Romanian President yesterday, that the lunatics are running the asylum. The only question is, when will enough honest and honorable Republicans admit this, take steps to end our national nightmare, and free the nation and the world from Trump’s paranoid and delusional roller coaster ride? The day after James Comey testified under oath that Trump demanded his loyalty, asked him to stop investigating Michael Flynn, and lied about the reason for Comey’s firing, Trump came out and called Comey a liar and said he would repeat his claims under oath. Hmmm who should we believe, the career boy scout or the pathological and delusional liar? Under Trump’s view, fed by Stephen Bannon and Corey Lewandowski, among others, Comey was part of the so-called “deep state,” you know, the secret group of intelligence officers that really run the country. Yes Trump’s mind is under the control of the alt-right lunatic fringe. Trump is mysteriously not bothered in the least by Russia’s cyber attacks on our country. For someone who repeatedly claims there was no collusion with the Russians, everything he and his administration does makes them all look guilty. The smoke is so thick we can’t breathe. We will find the fire. 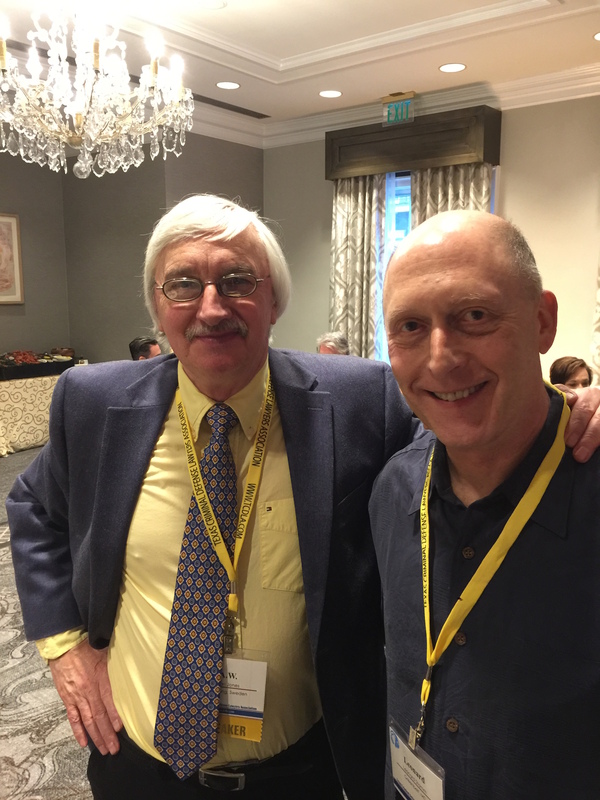 Last week, on March 22 and 23, 2017, the National College for DUI Defense and Texas Criminal Defense Lawyers Association successfully concluded their jointly sponsored annual Mastering Scientific Evidence seminar in New Orleans. Speakers included Robert Hirschhorn on Winning Voir Dire in Breath, Blood & Accident Cases, Amber Spurlock on Mining for Gold in Blood Discovery: Obtaining What You Need & Using It To Win, Donald Bartell on Successfully Defeating Hospital Blood Test Cases, Dean Jim Nesci on The Cure for Bad Breath 3.0, Alan Wayne Jones, BSc, PhD, DSc on Over 40 years and 400 Published Articles in Alcohol Research: Pushing Science to the Limits, Robert J. Belloto Jr., R.Ph., M.S.2, Ph.D. on Prescription Medication & Alcohol: Interaction and Metabolism – Determining Therapeutic v. Non-therapeutic Levels, Alfred E. Staubus, Pharm.D., Ph.D. on Breath Testing: Reported Measurement of Uncertainty for Various Evidential Breath Testing Machines and Aspects of the Biological Variability, Donald J. Ramsell on Method Validation And Admissibility Of Forensic Alcohol And Drug Tests, Andrew Mishlove on Blood Testing for Drugs: Methodology of How It’s Done & Success Challenges, Dr. Jimmie L. Valentine on Exposing False Positives in Drug Testing, Terry A. Wapner on Affecting the Breath Test Results – LPR vs. GERD, and Steven W. Rickard on Winning with Speed, Distance & Time. Among the speakers listed above was A.W. Jones, the leading expert in the world on blood and breath testing with over 400 published articles, who answered questions from Leonard R. Stamm regarding calibration of breath test equipment and calculating uncertainty. With respect to calibration, Dr. Jones opined that where a state has different levels of culpability carrying different punishments, such as Maryland, where the Motor Vehicle Administration suspends driver licenses for test result of 0.08 or above but less than 0.15 and for a test result of 0.15 and above, that the state should calibrate its breath testing equipment at both levels. This is important because Maryland only calibrates its breath test equipment at 0.08. Dr. Jones also stated that there is currently no accepted protocol for determining uncertainty. Dr. Jones preferred method for eliminating uncertainty is to take the mean of two measurements and deduct 15% of the mean to attain a certainty of 99.9%. Congress, please stop this insanity before it is too late! This is not and will never be normal. Trump’s continued lying and fabrications are the product of a deeply disturbed mind. Congress, we cannot continue like this for four years and you know it. • Refugees coming from Mexico are not likely to be criminals and rapists. • Refugees from Muslim countries who have been already subject to extreme vetting are not likely to be terrorists.